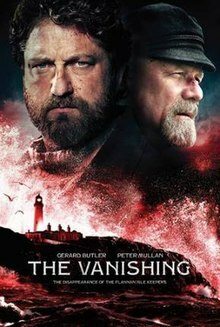 The Vanishing, previously titled Keepers, is a 2019 Scottish psychological thriller film directed by Kristoffer Nyholm and written by Celyn Jones and Joe Bone and set in the Flannan Isles which have been notorious for the mystery disappearance of three lighthouse keepers in 1900. The film stars Gerard Butler and Peter Mullan. Definitely some wasted potential with this one. Gerard Butler and Peter Mullan give really solid performances as does the kid who is with them and I enjoyed the set-up/build-up, but its a film that becomes less uninteresting the more it goes on and the ending was just really underwhelming IMO.